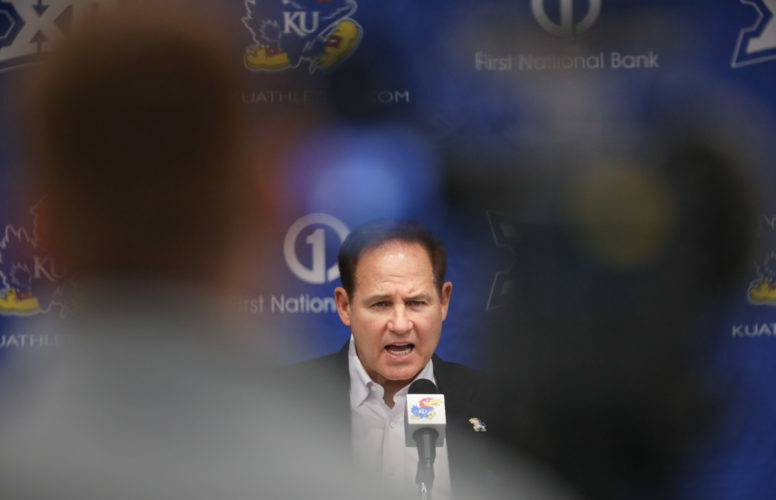 For a man who has gone out of his way the past several weeks to reveal as little as possible about what’s going on behind the scenes of his Kansas football program, head coach Les Miles made a relatively startling statement on Monday evening regarding his new team. Asked shortly after the conclusion of KU’s 15th and final spring practice for his assessment of how competitive the Jayhawks could be this fall, when the real games arrive, Miles began framing his response by saying how difficult it is to predict at this stage of the year how many games a team is capable of winning. However, the former LSU and Oklahoma State coach wasn’t done there. To reiterate: The former head coach of the Oklahoma State Cowboys and the LSU Tigers said on the record that this current group of Kansas Jayhawks “could be more talented” than the teams he coached in his debut seasons at OSU and LSU. In 2001, Oklahoma State gave Miles his first head coaching job. The Cowboys finished 4-7 overall and 2-6 in the Big 12. After leading OSU to three consecutive bowl appearances in the following three seasons, Miles was hired to replace Nick Saban at LSU. In 2005 (Miles’ first season in Baton Rouge, La. ), the Tigers finished 11-2 overall, 7-1 in the SEC and won the Peach Bowl. LSU had JaMarcus Russell, the eventual No. 1 pick in the 2007 NFL Draft, at quarterback. What’s more, future first-round pick Joseph Addai served as the leading running back and future first-round pick Laron Landry led the way in the secondary. KU hasn’t won more than three games in a season since 2009, when the Jayhawks went 5-7 in Mark Mangino’s final year in charge. Miles didn’t name any of the aforementioned LSU players. Nor did he single out any individuals on this 2019 KU roster as possessing talent of that caliber. He predict any Jayhawks he’s coaching now will one day become first-round picks, either. 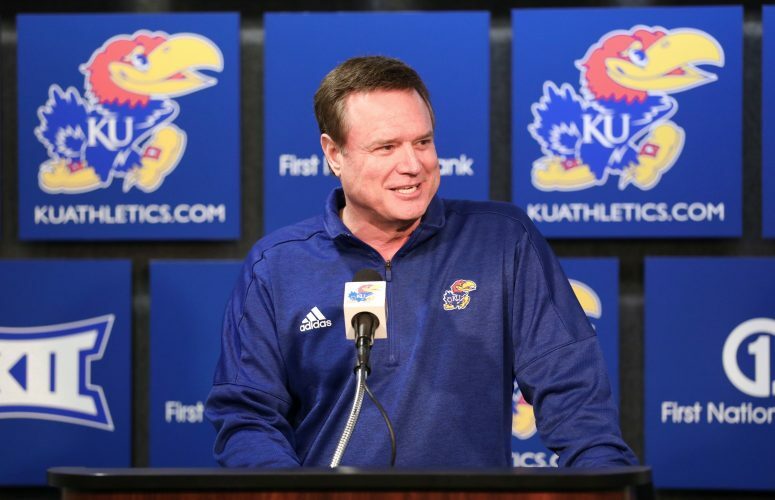 His bold statement about KU’s talent came down to his opinion of what he has watched these past several weeks, over the course of 15 practices. So what makes Miles think that this KU team could be more talented than his Year 1 teams at Oklahoma State and LSU? Miles opened his press conference by describing what he thought his new team accomplished this spring, during a nearly six-week span of not only practices, but meetings, video study and much more. 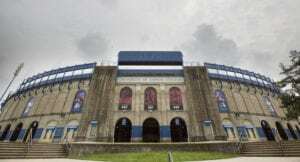 KU’s head coach, of course, laid all this out just two days removed from the program’s Saturday spring game at David Booth Kansas Memorial Stadium, where the offense delivered several chunk plays and scored 45 points, with running backs Khalil Herbert (154 rushing yards) and Dom Williams (97 rushing yards) leading the way. In that final scrimmage of the spring, Miles liked what he saw when the first-team offense went up against the first-team defense, and when second-teamers faced first-teamers. He described the offense as “good” during the spring game and the defense as “strong,” noting the offense’s biggest plays of the night weren’t coming against KU’s first-team defense, and praising the defense and redshirt sophomore safety Davon Ferguson for his second-half interception return for a touchdown. 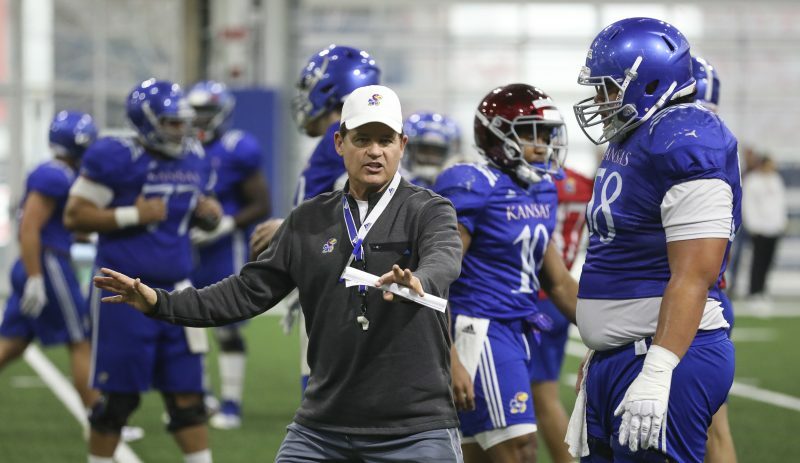 As one might expect at KU in mid-April, with the season opener still four-plus months away, Miles was not ready at the end of spring football to name a starting quarterback. 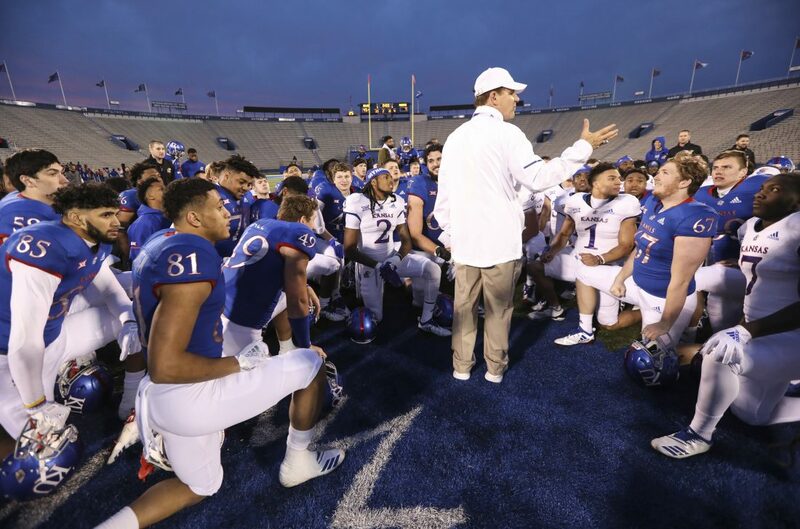 “I think that there’s a real quality group there,” KU’s coach said, after six different QBs attempted at least three passes during the spring game. On Saturday night, junior Thomas MacVittie completed 12 of his 21 throws for 95 yards. Redshirt senior Carter Stanley went 6 for 17, with 71 passing yards. But Miles and his staff have seen much more of the two quarterbacks than the general public. Both redshirt sophomore Miles Kendrick (3-for-9 passing, 22 yards) and freshman Torry Locklin (2 for 5 passing, 11 yards, and 29 rushing yards and a touchdown) also took first-half reps during the spring game, as four QBs took turns rotating in for a series. 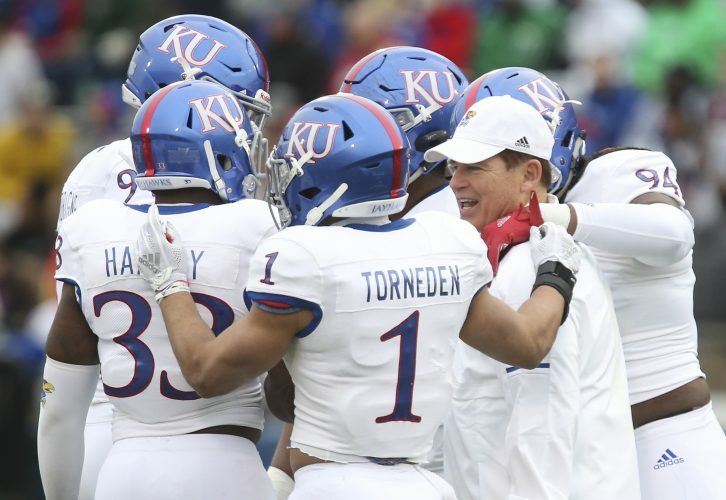 According to a report from 247 Sports, KU linebacker Robert Topps III has entered college football’s transfer portal. Topps, a signee in KU’s 2017 class, was recruited as a defensive back, out of Marist High, in Chicago. Listed at 6-foot-3 and 201 pounds as a redshirt sophomore, Topps spent the spring playing linebacker. He was credited with a solo tackle, a forced fumble and a QB hurry in the spring game.